The humble feng shui turtle, or tortoise, is really one of the powerful four Celestial Guardians in Classical feng shui. 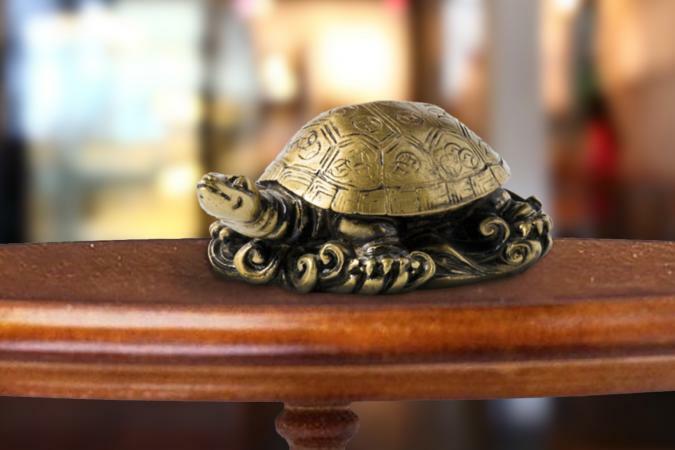 Add a replica or real turtle to your decor or landscaping for luck, longevity, serenity, and career success. The terms "turtle" and "tortoise" are used interchangeably in feng shui; they refer to the spirit of one of the most auspicious animal figures used as a remedy or luck enhancer. Ancient legend recounts the emergence of a turtle from the Lo River and the recognition of the emperor that the markings on its shell mimicked the energy map used in feng shui. 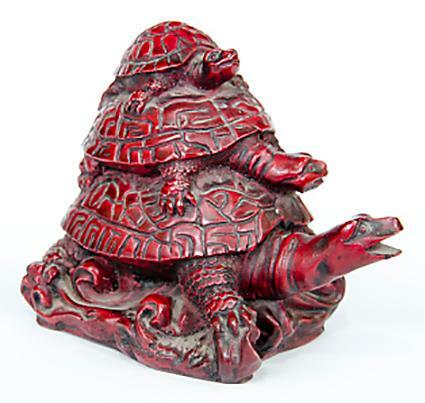 A regular turtle, real or a statue, or an enhanced turtle powered by the fearsome fiery energy of the dragon (another Celestial Guardian) will bestow wealth, restful sleep, vibrant health, a long life, financial windfalls, and professional rewards. Face a turtle towards the front door to ground the energy and protect the home and its occupants from misfortune. Position it behind you in a home office for additional support and security. The dragon turtle is an awesome force. The creature has the body of a turtle and the head of a dragon, stands or crawls on a bed of coins and often carries a baby turtle on its back. The dragon is associated with the East and the color green. The turtle is a North energy enhancer and its color is black. Put those together and you blow out prosperity, protection, longevity, and security. This creature has your back. Ideal areas to place the dragon turtle depend on what you want to attract. For career advancement, place a dragon turtle in the North or Northwest corner of your home or office. A dragon turtle in the East or Southeast improves family health and attracts abundance. During the Shang dynasty (1766 - 1122 BC) tortoise shells were used for ceremonial divination to predict the future. The ancient Chinese believed the turtle contained all the wisdom of heaven and earth within its shell. Today, you can use turtles and tortoises along with feng shui practices to attract safety, wealth, and good fortune. A large turtle with two small turtles stacked on its back represents three healthy generations and is a potent longevity symbol. 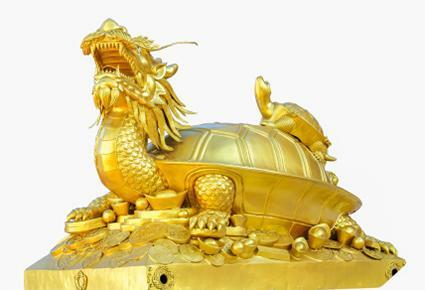 A dragon turtle, sitting on a "pedestal" made of coins or ingots, gets extra money luck with a Chinese coin in its mouth. The calligraphy on the coin should always be facing up as should any gemstone embedded in the coin. A mound-shaped figure of a turtle displayed in the backyard or rear garden can substitute for a rise, hill, or mountain at the back of the property, a landscape feature considered essential for safety and security. Tuck a tiny turtle under your bed for more restful sleep and to help cure insomnia. For even stronger good fortune, use feng shui turtles made of quality materials such as beautiful woods or gemstones, like jade. Turtles are no slowpokes when it comes to dominating key creation myths and life-changing legends of good fortune. Feng shui gives turtles a central place in luring and securing robust health, opportunity, and abundance for those who display them. Experiment with your own turtle luck whether you add a tiny jade turtle paperweight to your desk or a trio of Western Painted Turtles to your backyard pond. Play the long game with smart feng shui and a friendly turtle to attract a continual stream of blessings into your life.